People love the pizza sold at the Christmas Markets in the town of Regensburg, Bavaria in Germany as they are cooked in an outdoor pizza oven. Flames burn hot as two pizzas cook at one of the market stalls at the Christmas markets held in the old town of Regensburg in Bavaria, Germany in Europe. These mini pizzas are sold by the dozen as they are cooked to perfection in the outdoor pizza oven.Mini pizza being cooked in a wood oven at the Christmas Markets in the old town of Regensburg (a UNESCO World Heritage Site), Bavaria, Germany, Europe. 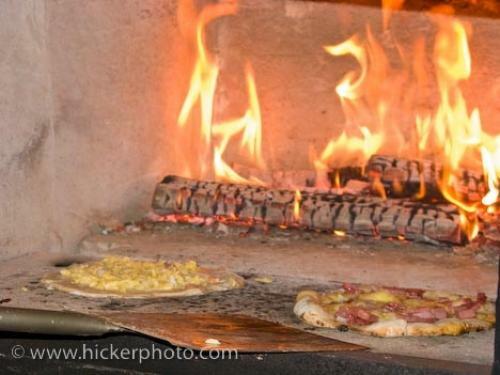 Photo of the fire in an outdoor pizza oven where pizzas are sold to visitors at the Christmas markets in Resenburg, Germany.